Rice University nanophotonics researcher Isabell Thomann uses lasers, light-activated materials and light-measuring nanoscale tips to push the boundaries of experimental nanoscience, but light is providing the pull in her latest study. In a new paper in the American Chemical Society journal Nano Letters, Thomann and colleagues, including postdoctoral fellow Thejaswi Tumkur and graduate student Xiao Yang, combine experiment and theory to test a new technique called “photo-induced force microscopy,” which probes the optical properties of nanomaterials by measuring the physical force imparted by light. Thomann’s primary research centers on using nanoparticles and sunlight to reduce the carbon footprint of power plants. The work crosses boundaries of chemistry, optics, electrical engineering, energy and the environment, but a major focus is photocatalysis, a class of processes in which light interacts with high-tech materials to drive chemical reactions. “Many experiments nowadays are done under high vacuum, but I want to run the reactor in my lab under more realistic conditions — normal temperature, normal pressure, in the presence of water — that will apply to capturing sunlight for photocatalysis,” said Thomann, an assistant professor of electrical and computer engineering, of materials science and nanoengineering and of chemistry at Rice. Thomann has been working to develop new tools for measuring nanomaterials since arriving at Rice in 2012. She and her team are developing an ultrafast laser spectroscopy system that can read the optical signatures of short-lived chemical processes that are relevant to artificial photosynthesis. Thomann’s group designs light-activated nanoparticles that can capture energy from sunlight and use it to initiate chemical reactions. The nanocatalysts, which can be tiny rods or discs of metal or other materials, interact with light due in part to their shapes and how closely they are spaced together. Thomann said that while engineers make every effort to produce uniform particles, small imperfections still exist and can have significant consequences on performance. 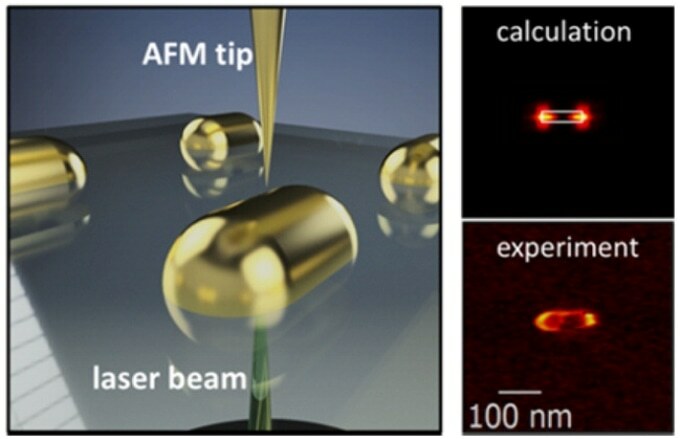 In the photon-induced force microscopy experiments, Thomann’s team used a tiny tip from an atomic force microscope (AFM) to enhance the spatial resolution of measurements taken from gold nanorods and nanodiscs on glass surfaces. The rods and discs, which are smaller than the wavelength of light used to measure them, would normally be blurry in an optical microscope due to a physical property called the diffraction limit. To better resolve the nanoparticles, and the electromagnetic interactions between them, Thomann’s group shines light at the particles and uses an AFM tip to probe how these nanoparticles act as optical nanoantennas and concentrate the light. Thomann said the study provides theoretical understanding of how photo-induced force microscopy works and lays the groundwork for future studies of more complex photocatalyst materials her team hopes to create in the future. She credited her group’s improved understanding of the force-measuring technique to months of hard work by co-author Xiao Yang, a Rice graduate student in the group of theoretical physicist and study co-author Peter Nordlander. Yang said the most difficult part of coming up with an explanation of the team’s experimental results was creating a solvable computational model that accurately described the real-world physics. For example, including the entire tip in the model made the mathematics impractical. Yang eventually hit upon an idea — including just a portion of the tip in the model — that made the calculations both feasible and accurate. Thomann said this was just one example of Yang’s tenacity in finding a workable solution. “He is exactly the kind of graduate student we want: knowledgeable, hard-working and unwilling to quit in the face of adversity,” she said. Tumkur is a member of the Thomann research group and a J. Evans Attwell-Welch Postdoctoral Fellow at Rice’s Smalley-Curl Institute. Additional co-authors include Benjamin Cerjan and Smalley-Curl Institute Director Naomi Halas, Rice’s Stanley C. Moore Professor of Electrical and Computer Engineering, professor of chemistry, of bioengineering, of physics and astronomy, and of materials science and nanoengineering. The research was supported by the Welch Foundation, the National Science Foundation and the Smalley-Curl Institute’s J. Evans Attwell-Welch Postdoctoral Fellowship Program.